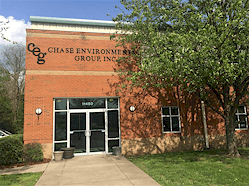 Chase Environmental Group (Chase) was contracted to remove elemental mercury from drain traps for several laboratories at a university. Chase inspected, cleaned, and monitored over 600 drains in less than one week. 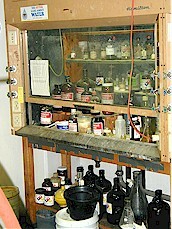 Chase personnel worked closely with university personnel to ensure that routine classroom activities and vital experiments were not disrupted during the cleaning. In addition to removing the elemental mercury, Chase removed over one drum of small debris, glassware, sharps, and other material from the drains. The project involved detailed performance monitoring and pre- and post-project monitoring of university effluents. Post-project monitoring revealed that mercury levels had dropped dramatically due to the remediation. Later, Chase was contracted to remove mercury contamination from the acid drain line system. Chase fabricated a water treatment system and installed it to manage the water generated from the process. Then Chase personnel commenced cleaning the glass piping system using high pressure jetting, flushing out mercury, sand, carbon, and biomatter. Drains that had been previously blocked were restored to "as new" operating condition. Materials that were flushed out of the system was collected and packaged for disposal.